Tell us when and where you want to go. Chances are there is an airport very close to your destination. No lines, no waiting, no parking fees. We meet you, load baggage and go! This is perfect for the business man looking to save time instead of driving. Your neighborhood from the air, San Juan Islands, Downtown Seattle, Mt St Helens, Cascade Mountains, Glacier Peak, Mt Ranier. We can take you there on Friday and pick you up on Sunday. Why drive for hours and spend your precious time stuck in traffic? No Ferry lines or road construction to deal with! San Juan Islands ~ Washington Coast ~ Oregon Coast ~ Idaho - Camping Spots ~ Romantic Trips - Anniversaries ~ Birthdays ~ Hunting and Fishing Trips too! 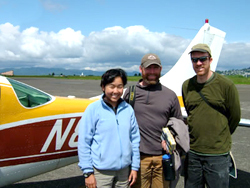 We are based at Arlington Municipal Airport, Arlington WA, serving the entire Northwest. Gold Aero provides flying services addressing the individual needs of the customer. Our company caters to the business and recreational traveler alike. Gold Aero can take you to a destination on Friday and pick you up on Sunday. If you have an out of town meeting we can get you there quickly, standby until the meeting is over and fly you home. Flying can save a lot of time. Traffic, roadwork and detours don’t affect air travel. Most people are unaware they probably have an airport only a few miles from their home or business. Gold Aero can pick you up when you are ready and get you to the airport closest to your destination. All this in fraction of the time it takes to drive. 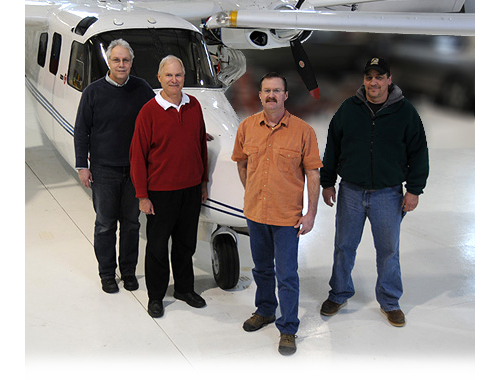 We operate meticulously maintained aircraft that are kept in tip top shape. Our pilots have a combined flying experience of over 100 years without accident or incident. Biologists with the Oregon State University and U.S. Geological Survey gather data on Terns, Cormorants, Pelicans and Bald Eagles along the Columbia River. 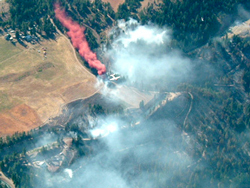 GOLD AERO is licensed by the state of Washington for scattering of human cremations by aircraft. Gold Aero has been sensitive and flexible with family’s requests for many years. Scattering locations include; Puget Sound, San Juan Islands, Cascade Mountains and other locations. Warning: It is illegal to scatter cremations by air without a Washington State Cremations disposition permit. There are plenty of stories of attempted scatterings gone terribly wrong. Each scattering location will be researched for accuracy and legality of scattering prior to agreement!